My favorite public art sculpture at the moment can be found in the little artsy-craftsy town of Berea, Kentucky, USA. It's a very small college town with a unique history of craft skills at the local college. 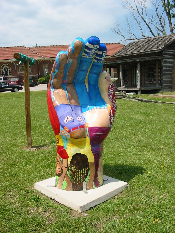 There are several themes to the public art, as well as pieces related in material, color, and feel. My very favorite is the hands, I suppose because hands are universal. It's also almost a pun on the idea of "hand-made." 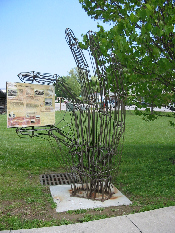 These sculptures appear around town and are made of a number of different materials. I have just been able to send you four photos, but there are several more. Because the town is so small, these sculptures are even more striking. I think it would not be very interesting for them to have one big sculpture celebrating craftsmanship, but when they have a number of these smaller sculptures in a variety of media and sizes, it is very effective and pleasing. Editors Respond: Yes, we agree that in this case, the choice of hands as a subject of the public art is a deliberate attempt to tie the art to a prominent theme and identity of the local liberal arts college. Even though there is a serious and even intellectual purpose, the art at the same time serves to surprise and delight, which are two important features of all but the most artistically significant public art installations. Children enjoy these sculptures a great deal. An additional function is that some of them add a pop of color to an otherwise white, green, and gray space. They also fill empty space in what might otherwise be perceived as a somewhat boring lawn area on an average day in town. These lawns probably are lively on the first warm day of spring or when there are large crowds at the college, but on an ordinary day, the art livens up the space. The lesson to be learned by an artist selection committee is that the ability to carry out a theme in a recognizable but slightly unpredictable way is a very important qualification for a public sculptor. Join in and write your own page! It's easy to do. How? Simply click here to return to Best Public Art.